This book, it must be said, boasts an innate difference from the many current books which propound the supposed "mysteries" of various traditions of Witchcraft, Wicca, and other arcanae. In a word, this book makes no promises, offers no answers, fills no loopholes, catches no Lapwings. The work is a dance between Dog and Deer, Deer, and Bird, Bird and Dog*, one in which no one loses a life, questions are offered to many an answer, and nothing is decided by the dance except the certainty on the part of the reader of the absolute necessity of such works in the hermetic library, works which offer philosophia rather than prestidigitation. The quotation above, "not for the feint-hearted", is taken from the Preface, and I was immediately taken by the subtlety of the not-misspelled adjective, and became aware very soon thereafter that the phrase bore as many levels of insight and layers of meaning as does the book itself. The feint-hearted, those who are looking for quick tricks of the hermetic hand with which to baffle and amaze the once-born, will find no fodder here. The book is Craft in its totality, fully intending to cloak, as my mentor Joseph Bearwalker Wilson was wont to say, "a method, wrapped in a mystery", hoping that the sincere and insightful reader will be able to grasp at the cloak of the Mystery wrapped in the Method. Like a well-respected predecessor, The White Goddess by Robert Graves, the book is written in a style which can only be described as mythopoesy. The Preface is a highly literate, fully annotated and daringly speculative look at the origins of both the concepts of dualism in religious thought and the roots of Craft itself. The language and content here does presuppose that the reader has something of a background in academia, with an emphasis on anthropology, philosophy of religion, and literary history. Moving from this into the content of the chapters is like taking a voyage of discovery after a year spent studying the atlas. One will "land" in a chapter very like the intellectual tourist wishing to spend a year or more at each docking point and thoroughly familiarize hirself with the new territory. Each chapter in turn, beginning with one which does indeed discuss, exemplify and seek to source the reader in the aforementioned "mythopoesy", and moving through the Mysteries as accessed by the Clan of Tubal Cain, is contemplative, thought-provoking, shatteringly literate, and fully functional as a guide, whilst forbearing from revealing anything of the arcanum which must be fully and personally encountered in personal practice of the Witch. WARNING: This is not a "beginning Witchcraft" kind of a book. This book is for those whose feet are already securely seated on the Path, those who wish to have a hermetic glimpse of another angle of the Thicket. This book is most suited to long and contemplative study, perhaps with academic tools at hand with which to explore the many side-paths referred to in the text, but always knowing that what one is seeing is only a glimpse of the tail-feathers of the Bird, a tantalizing glance between the horns of the Deer, a swift pat in passing at the questing Dog. 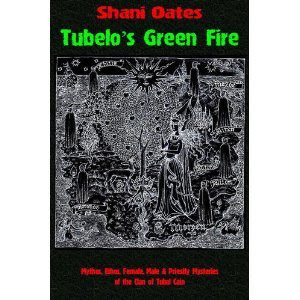 The author, Shani Oates, Maid of the Clan of Tubal Cain, has enriched her Legacy and done more than justice to the ethos of the teachings of Robert Cochrane as illuminated by Evan John Jones. This book is, without doubt, one of the most intriguing and illuminating books I have had the good fortune of perusing in many years. But it is not a how-to, not a go-to, not an encyclopedia. It's a voyage of discovery. Enjoy the trip! *and, if you have no idea what I just said, you probably need to be reading something else.